If you are planning on visiting Florida in February, while most of the United States and Canada is experiencing some of the coldest temperatures of the year, you will find it can be quite mild throughout the state. While Miami, Key West, and the other south Florida cities experience balmy temps year-round (averaging 70 degrees Fahrenheit or warmer this month) perfect for beach days and ocean swimming, central and northern Florida are typically cooler than most people expect and can get close to 40 degrees Fahrenheit in the evenings. The temperatures begin to warm up toward the end of the month, but there is a chance for cool temperatures throughout the entire month in central Florida and above. Hurricane season doesn't begin until June 1, so you won't have to worry about the terrible tropical weather. However, cold fronts that breeze through the state during February can produce short-lived, intense storms. The water temperature for the Gulf of Mexico on the western coast ranges from the above 50 degrees Fahrenheit (10 degrees Celsius) to the high 60s F (20 C) this time of year. The Atlantic Ocean on the east side averages in the mid-to-high 50s F (15 C) from central Florida and above. The beaches to the south, such as West Palm Beach, Miami, and The Florida Keys, are always several degrees warmer than those located further north. Since Valentine's Day falls in the middle of the month, if you're planning a romantic getaway, don't forget to pack dress-up clothing for a special night out. Besides wanting to impress your significant other, your restaurant of choice may require a dress code. Shorts, sandals, T-shirts, and sundresses are a must for the Florida sun, but also be sure to take along a sweater and jacket for possible chilly nights. You should also pack a bathing suit, even if you don't plan on hitting the beach since most hotel swimming pools are heated. And, don't forget your sunblock—even on cloudy days, you can still get a bad sunburn. There are plenty of events to enjoy throughout the Sunshine State, for lovers, singles, and families alike. Valentine's Day in Florida (February 14): Enjoy romance-inspired activities and getaways for this special day for couples. Seven Seas Food Festival (mid-February through April): Enjoy local craft beers, listen to live concerts and performances, and taste new culinary delights at this popular annual event at SeaWorld Orlando. Florida State Fair (early to mid-February): Showcasing the best Florida has to offer in the agribusiness, this event is held each year in Tampa, and draws families and farming fans alike from all over the state. Lake Worth Street Painting Festival (end of February): Guests can stroll the downtown streets of Lake Worth to view the most beautiful chalk art street paintings from 600 different artists, for free. Praise Wave Music Festival (late January through mid-February): Another wonderful event held at SeaWorld Orlando that combines fun and fellowship in a Christian atmosphere. Enjoy live performances from the hottest names in Christian music, as well as amazing shows and the thrill rides SeaWorld Orlando is known for. Universal Orlando Mardi Gras (early February through April): Universal Orlando will be transformed into the "Big Easy" with its annual one-of-a-kind Mardi Gras celebration featuring parades, live music, and much more. 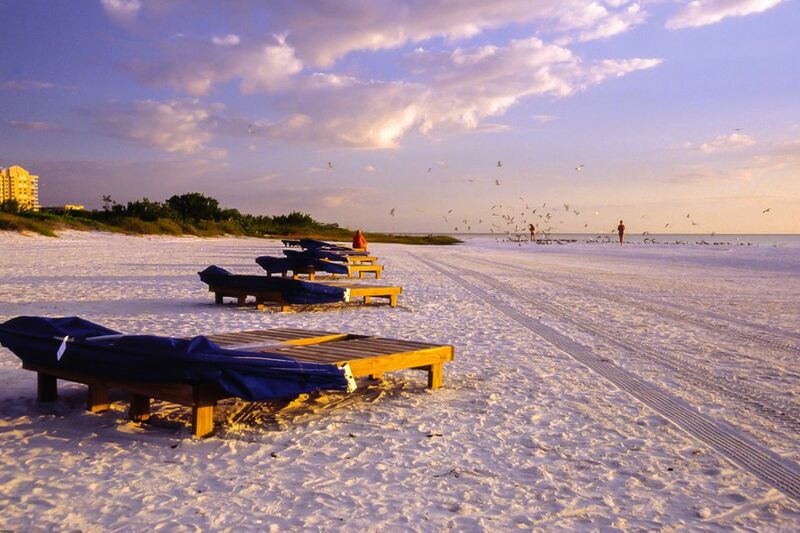 Florida's mild climate continues throughout the winter months. However, there is a chance for cold temperatures—even frost—during the first half of February in both northern and central Florida. So, if you plan on enjoying the famous white sand beaches, you may want to plan your trip later in the month. February is a great time visit Disney World. During the first week of February, attendance is low, and you can expect more moderate crowds the second week of the month. Presidents Day is a holiday, making the third week in February one of the month's most crowded times, so you should avoid visiting at this time if you can. Attendance at Universal Studios Orlando in February tends to mirror that of Disney World, so even if you're skipping the Magic Kingdom, you can anticipate similar crowds.